We maintain a wealth of resources for teachers, students, and community groups. We provide in-classroom and camp programs about soil, water, and other natural resources. For 50 years, nearly 500 Holmes County 5th graders have participated in the Tom Graham 5th Grade Conservation Farm Tour. It has become a rite of passage for Holmes County 5th graders. Students visit a working farm and learn about conservation techniques and the importance of protecting natural resources. After the tour, students write an essay about their experience and submit the best from each school for our annual essay contest. East Holmes & West Holmes FFA chapters also sponsor a farm-safety poster contest in conjunction with the tour. Winners are honored at our annual meeting. Click here to learn more about how this program aligns with Next Generation Science Standards. Our staff of experienced educators provide engaging, hands-on standards-based educational programming to students of all ages on a variety of topics relating to soil health, the water cycles, wildlife, and other conservation and resource topics. Click here to learn more about our current programming opportunities. 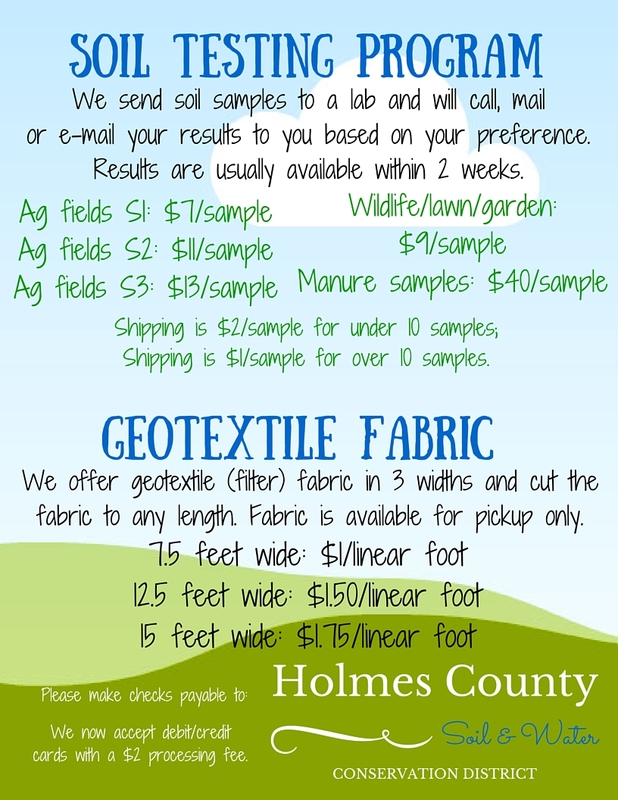 Holmes SWCD now offers a wealth of conservation, wildlife and agricultural education resources to teachers and community groups in Holmes County at no cost. Click here to learn more about our current lending library resources. Each year the Holmes Soil & Water Conservation District sponsors several scholarships to Camp Canopy. Students must have completed 8th grade to be eligible. Camp is held each year the second week of June at Ohio FFA Camp Muskingum just outside of Carrollton. Click here for more information on Camp Canopy. You can also download the scholarship application here. Our office is a sponsor of the Ohio Envirothon, which is a great opportunity for high school students to work as a team to learn more about natural resources. Envirothon is a high school competition designed to stimulate, reinforce, and enhance interest in the environment and natural resources. Students are tested on their knowledge of soils, forestry, wildlife, aquatic ecology, and current environmental issues. Envirothon encourages cooperative decision making and team building. A team consists of five students, all from the same high school.